In our last blog on business rates in September, I talked briefly about the impact of 2017’s business rate revaluation on the retail sector and its disparities. But, beneath the headline figures, there is more. The retail sector is a sector that overall will benefit from the revaluation with an average 5% fall in next year’s rates bill. Outside central London and parts of the South East, rate increases are few and far between with most major towns seeing reductions in the rates applied to their prime locations. But, on detailed analysis, the impact of the revaluation is far from uniform and some regions will benefit more than others. 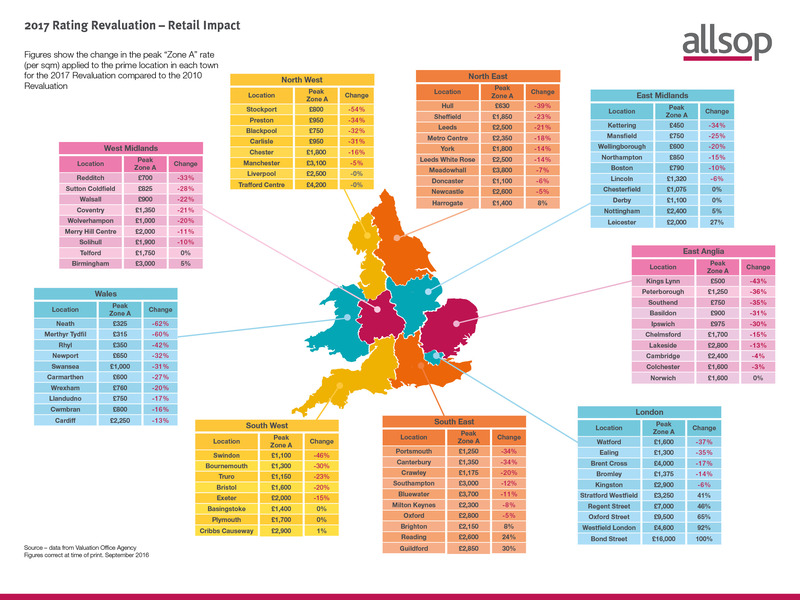 East Anglia and the North West are set to gain with none of the major towns having an increase in the pricing for prime locations and the majority having significant reductions. Some of the largest reductions will be in Wales with Neath and Merthyr Tydfil benefiting from reductions of over 60%. Drilling down further, there are significant variations within regions. In the South East, Canterbury and Portsmouth have had falls of over 30%, contrasting with Guildford and Reading where increases are over 24%. The revaluation’s main losers are retailers located in some central London locations. The ‘Zone A’ rate in Bond Street has doubled to £16,000 psm and Oxford Street has increased 65% to £9,500 psm. Both the Westfield centres have been hit hard with Westfield London seeing a 92% increase. However, falls in rateable values do not automatically lead to a corresponding fall in liability. In England, large increases in rates bills are capped, but this is financed by capping the amount by which rates bills can be reduced. This means that, despite some massive falls in the values, most retailers will only have a maximum 10% reduction in their 2017 rates bills with some larger stores only getting a 4% reduction. In Wales, however, the capping of rate reductions was abolished many years ago and retailers will get the immediate benefit of often major reductions on their 2017/18 rates bills. For all the previous revaluations since 1995, rate increases in England have initially been capped at 12.5%. But, for 2017, properties with a rateable value of more than £100,000 will potentially see the cap raised to 45%, leading to massive overnight rate increases. I still believe that the fairest system for all would be to abolish caps on reductions, limit all increases to 12.5% and put in place a small supplement on the Uniform Business Rate to finance the cost of capping. 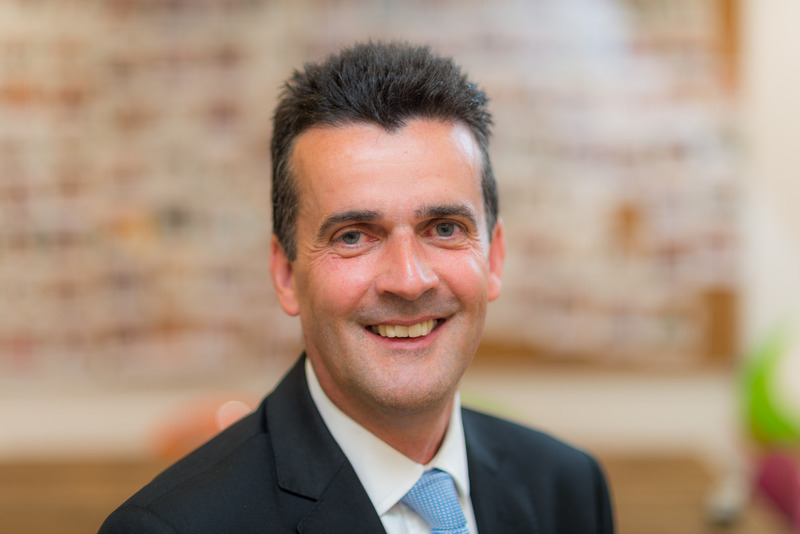 Robert Sherwill is partner at Allsop and heads up the Business Rates team. He specialises in the retail sector and has a vast range of experience. Robert is Chairman of the influential Rating Surveyors Association Retail Panel and is a past member of the RICS Rating and Local Taxation Policy Panel. He is responsible for chairing the rate appeal negotiations in many high profile retail locations including London’s Oxford Street and Westfield London. In 1999 he established and has since run the nationwide scheme used by rating agents to identify rate saving situations on shops.